The charred outside of 1451 Stevenson. Photo by Daniel Hirsch. A group of artists displaced by a fire at their home on Stevenson Street in January 2014 are being sued for the tens of thousands of dollars they originally received in eviction relocation assistance under a city ordinance. The Tenant Relocation Assistance Payment ordinance, passed in June 2014 and in effect for five months, required landowners to pay tenants the difference between their previous rent and market-rate rent for a similar unit for two years. It was struck down by two judges, first in October 2014 and again in March of this year. Most recently last month, a revision to the ordinance was struck down. Now the landowners are attempting to get back roughly $140,000 of the $190,000 they paid the tenants. The city attorney’s office has appealed both decisions and is planning to appeal the third decision. The outcome of the appeals could have an impact on anyone evicted by the Ellis Act in the roughly five months the ordinance was in place. The lawsuit, possibly the first of its kind, is the most recent development in a legal battle between residents of the Stevenson Street live-work space and the landowners who evicted those tenants following the fire. The eviction occurred after the landowners, Stevenson Street Partners, removed the property from the rental market through the Ellis Act. Of the eight tenants named in the lawsuit, several remain in the city, but none of them stayed in the Mission. During that time, tenants displaced by the Ellis Act received similar sums of relocation assistance under the ordinance, said Joseph Tobener, a tenants rights attorney representing the Stevenson Street tenants. Tobener alone is representing some 30 clients who received assistance under the ordinance. As a result of the eviction on Stevenson Street, at least four of the residents received at least $30,000 – some of them much more – in the so-called “Rental Payment Differential” assistance under the Tenant Relocation Assistance Payment ordinance, which was sponsored by Supervisor David Campos. The lawsuit against the tenants of the Stevenson Street artist warehouse argues that because the assistance payment ordinance was twice ruled unconstitutional, the law has now been “invalidated,” and the tenants of the artist warehouse must pay the difference between what they received and what was previously required by San Francisco’s Rent Ordinance – $4,500 a year, adjusted annually for inflation. As it stands, the tenants of the Stevenson Street fire would be responsible for paying back those large sums if a judge rules in favor of the landowners, Stevenson Street Partners, according to Tobener, who is defending the former Stevenson tenants against the most recent lawsuit pro bono. Tenants of the Stevenson Street warehouse who received the money have already spent it relocating, according to Tobener, and he believes the city should be responsible for covering the any potential damages resulting from this and other lawsuits of a similar nature. At the moment, the city has not made an official commitment on whether it would compensate tenants facing these kinds of lawsuits. “I don’t think anybody went out and bought a new car,” said Gibbs Chapman, who lived at the Stevenson Street warehouse for roughly 30 years and who has since moved to Oakland with his wife and young child. He, his wife, and child together received $45,074 in relocation assistance under the ordinance. He is now being asked to return $29,279. “What did they expect us to do with money – keep it around in case they’d sue us for it?” said Patty LaCava, who lived at the Stevenson Street warehouse for 27 years. She and her son together received $49,507 in relocation assistance and are now being sued for $38,977 of it back, according to the complaint. Tobener believes the city should pay. Christine Van Aken of the city attorney’s office, who is appealing the most recent decisions, declined to comment on whether the city would accept responsibility for the payments. A commitment to repay the relocation fees could mean large sums in payouts from the city. But while the defending the ordinance in District Court in August 2014 – before Breyer decided the law was unconstitutional – Breyer asked Van Aken hypothetically if the city would owe landlords the relocation assistance they paid to tenants if the law were deemed unconstitutional. Van Aken said in most cases the city would be responsible for paying landlords back, court records show. Months later, in October 2014, Breyer found the ordinance unconstitutional. The question of whether or not the city should accept responsibility for covering any potential damages against the tenants is something Campos office is “monitoring,” Ronen said. “We’ll cross that bridge if we come to it,” she said. Tenants should get to keep the money and the city should reimburse the landlords. City is clearly at fault for enforcing unconstituional law. You can’t expect an average citizen to pay back that kind of money when it was given to them to according to the law at the time. PRetty sure city won’t pay and somebody will be geting screwed. Indeed. Going after the former tenants is ridiculous and stinks of harassment. They were burned out of their homes, some climbing out windows to escape. The city is (was) responsible for the ordinance, if the ordinance is struck, the city is responsible (and bonus! Able to pay!). Meanwhile, the owners can sell that large piece of property or develop it and make a ton of money. Is this the building that wasn’t a legal residence in the first place because it did not meet code for residential living? The “progressive” board of supervisors is continually passing ordinances that are not legal as part of their agenda, and should be held responsible for the consequences. Yes. The building had housed artists illegally since the 1970s. 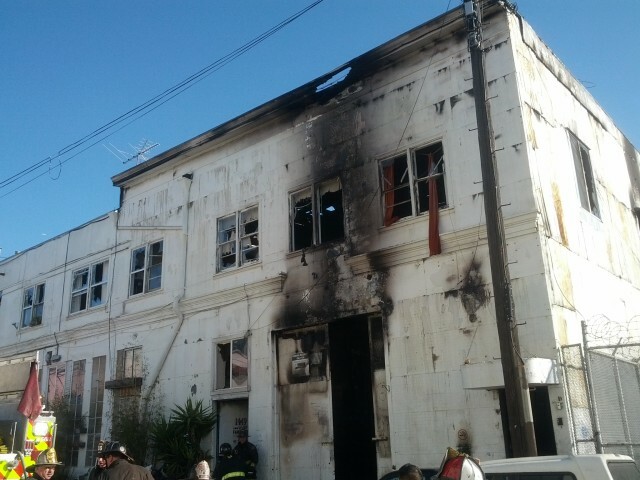 It was an industrial building and it was a fire trap due to decades of unsafe improvements. There are (or were) many post-industrial buildings used residentially and this building was one of them, a grey-area building that reflects the city’s schizophrenia between the rent board and DBI. The SFRB produced a document in 1992 ruling that there were 9 residential units in the building. The owners not only purchased the building in 2000 with the full understanding of its residential use, they conspired to maximize their profit while doing essentially nothing about the lack of fire preparedness. This was really the only area where ‘code’ was lacking, clearly a problem. Many owners of buildings that were too funky to attract mainstream ‘commercial’ tenants (The freight elevator had not worked since the 70s for example) turned first to artisan small business and then to the “So cool to live in a warehouse” crowd for profit.